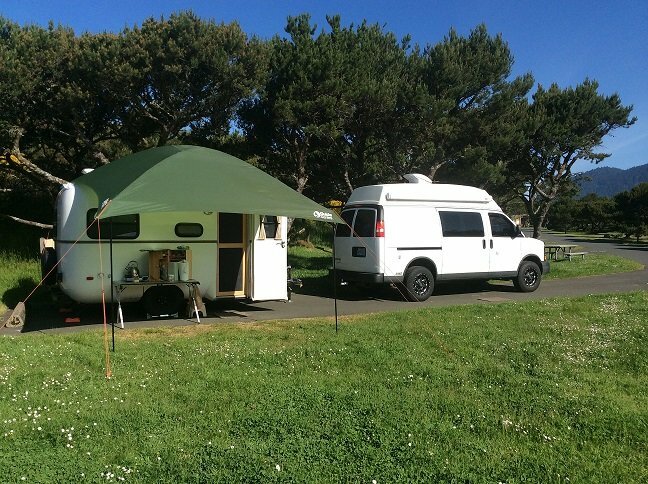 When we first got the Roadtrek nearly 6 years ago, we almost bought the attachable screenhouse for it (awning mount). After reading about what a PITA they are to put on and off all the time we decided to pass and get a standalone screenhouse. We settled on a 9.5' X 13.5' Eureka that would fit over a picnic table, as that sounded like a good idea. As it turned out, until our last trip we were never in one place long enough to justify setting it up. We quickly discovered that we didn't like it over the picnic table as it was crowded and no room for chairs, plus we use the picnic table for the grill on a propane hose so it had to be within 15" of the rear of the van. It worked fine once we moved it off the table, but it was large and a bit hard to find a good spot on our site. It had much more room inside than we needed for our two chairs and little table, but it was hard to use because the only guy line was inside from the peak to the ground with none outside. We decided to sell the Eureka and get a smaller one, to save the storage space and make getting a good area to set it up easier, but that is easier said than done, as there are very few smaller ones that aren't the tiny beach hut types. We finally decided on the this one. We hung a sign on the old one while in the campground and sold it there before we left. Set it up yesterday in the yard as a test, and it was very easy. Plusses were the fiberglass top poles, metal stakes, and external guy cords with quick tensioners. It is very small when rolled up. They don't show it on the manufacturer site, so it may be discontinued, or it could be because it appears the company changed ownership. Looks to be just right for a B. 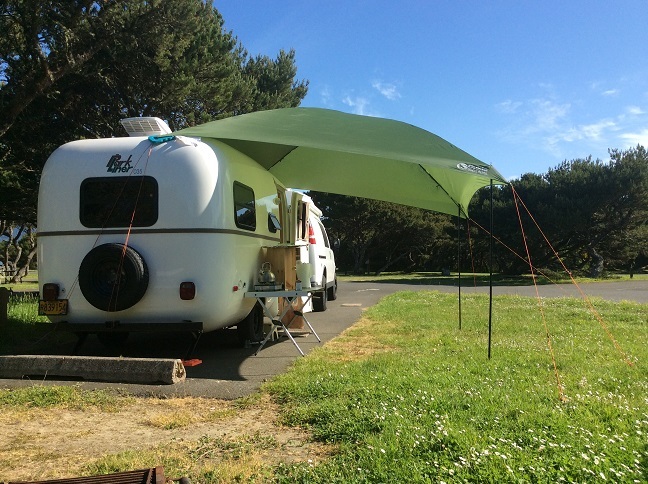 We have been carrying a similar Eureka screen tent for several years now. It packs into a 9" x 9" x 28" bag which is important for a B because so many of them are so big. Ours is a six sided tent large enough for a picnic table. 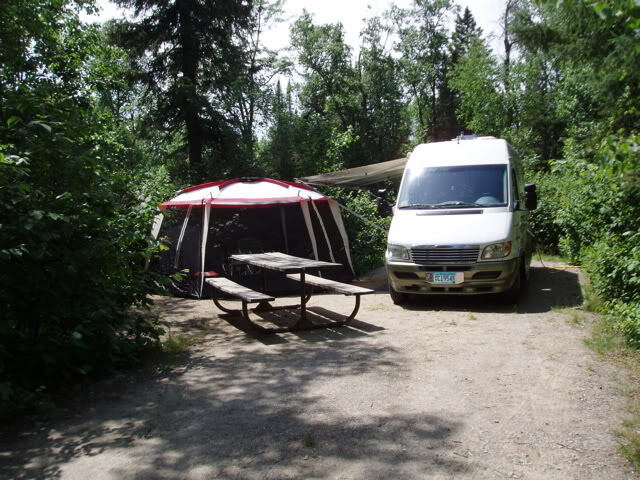 This is a setup with our old 2005 Pleasure-way Plateau at Bear Head Lake State Park near Ely, MN (mosquito country). We put it so the awning would cover and enable to walk from van to tent if it rained. We haven't used our screen room in a while. Maybe because it is too big at 15 ft. x 14 ft. x 7 ft. (harder to set up). I should dig it out and try setting it up and if it's too difficult then sell it and "downsize" like you did. Well it's not quite a screen room...but it is a nice shelter from sun and mild rain. 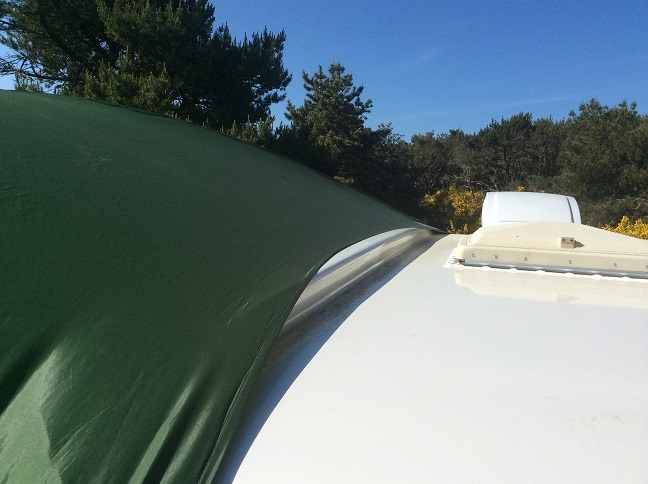 We use this Gardner Mountain 12x12 self standing awning next to our Parkliner trailer. Even though we have a nice galley inside the trailer my wife still enjoys cooking mostly outside (weather permitting). In our case we simply drape one edge over the curbside of the trailer and strap down, then support the other edge with included poles. snug as a bug. no rain is getting through from the trailer side. a close up of the Parkliner's "Anti-Trolley" roof. Most small fiberglass trailer's roofs increase height in center, Parkliner starts high on sides and dips down for strength and stealth of solar panels and such, still giving 6'4" of interior headroom. Thanks for all the great suggestions. We have a new Cabellas also a new Bass Pro store opening in Moncton in the spring Hopefully before we head south in Feb.
you'd do better to buy in the US than in Moncton. and may as well buy close to your destination- that way if it ends up being unusable you can easily return it. We were at our local Cabelas yesterday. This probably is not the time of the year to be shopping in their physical store for a summer screen house. They didn't have any on display or shelves. Canvas ice fish houses were plentiful. It is the same by the way if you are looking for backyard BBQ grills. About all they have right now are smokers for game meat. Maybe about February/March or so? I should also mention, not a screen house, per se, but there are a lot of four sided straight leg 10 x 10 sun canopies and some have walls you can add to make them screen enclosures. I thought about getting one as a lot of my B social friends have them and they put them together to make one large sheltered area when we get together. One problem with most all of them I have checked is they collapse down to about a 55-56 inch length. That is huge for a Class B. Anybody around SoCal can have the one that came with my rig for free. It defeats the purpos of a class b. The stand alone rooms make much more sense.